Last Friday (29th May) some of the conservation volunteers went to Black Spout woods near Pitlochry to help Greenspace Ranger Jeannie to clear out some tree cages. The wood is a semi-natural oak woodland which was managed as an oak coppice and is an easy walk from the town centre on pavements, or via the Edradour Path. There have been several trees planted over the last 5 years, including Hazel, Birch and Scots Pine. Most of these trees were planted in cages or tree tubes to prevent them being eaten by deer or rabbits. The task today was to remove any overgrown vegetation from within these cages that may have a negative impact on the growth of the planted trees, as well as releasing trees that had outgrown their tree tubes. There was a huge difference made in some of the cages. In some cases it was difficult to tell there was still a tree in the Scots Pine cages before they were cleared, but they now stand a much better chance after removing the encroaching plants. Around 10 to 15 birch trees were also freed from their tubes now they are big enough to avoid grazing by deer. The Amphibians in Drains Project was started in Perth and Kinross in 2010 after observations that a significant number of roadside gullypots contained dead amphibians and small mammals. Roadside gullypots are essential for road drainage but can act as pitfall traps when animals fall through the grid at road level, and once trapped it is unlikely the animals will be able to survive for any length of time. It was identified that a more robust study to ascertain the scale of the problem was required. The Amphibians in Drains Project was born! 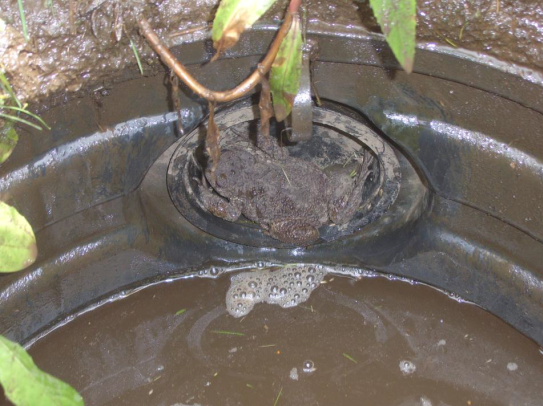 A large common toad wedged in a gullypot plug – escaping drowning, but with no way out. To estimate the number of drains that may be affected across eastern Perthshire and, through extrapolation, across Perth and Kinross. To estimate the number of amphibians & mammals that may be trapped. To record species of amphibian & mammals affected. To investigate if there is an association between adjacent habitat type and high numbers of trapped amphibians. To investigate if there is an association between proximity to ponds and high numbers of trapped amphibians. Results from the survey illustrated that gullypots create a substantial problem for amphibians and small mammals. A total of 3007 animals were found in 1565 gullypots, which works out at an average of 1.9 animal per gullypot. From these results we can extrapolate that with 37,252 gullypots being found across the county, if an average of 67% (24,958) of these contain wildlife (with an average of 1.9 animals trapped per drain), the total number of trapped animals would be 47,421 across Perth & Kinross per year. The survey showed that the majority of amphibians were found within 1km of a breeding pond. This information is significant for targeting road works involving gullypots or kerbs within a short distance of a breeding pond. If we were to target only these areas with a high incidence of trapped wildlife, this approach would ensure a low cost, high benefit solution. Not all amphibians are as lucky as this rescued frog – but things are looking up. In 2012 the Ranger Service started the Amphibians in Drains Pilot Project at Elm Drive in Blairgowrie, which involved replacing standard kerbs with wildlife kerbs, allowing wildlife to avoid the danger zone of the gullypot by following a recess in the new kerb. Consequent surveys have shown that these kerbs are working well, with far fewer animals falling into and drowning in the gullypots. 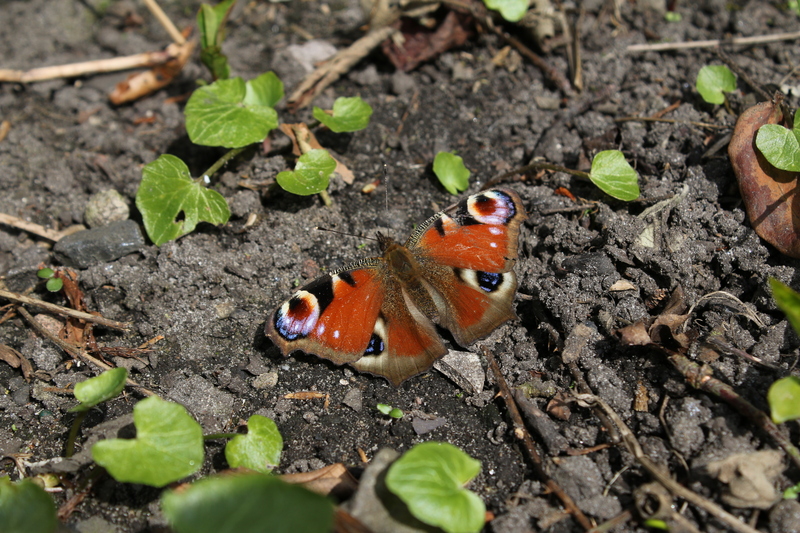 In 2015, working with the Tayside Biodiversity Partnership, ladders were placed in gullypots at a site in Lethendy, to enable wildlife which had fallen in to escape. The Perth and Kinross Conservation volunteers met up with Jeannie Grant the Highland Area Ranger to carry out some path drainage clearance work on Saturday 9th May at the Birks of Aberfeldy. The worst natural thing for paths is water! Especially water dripping off tree leaves! To save and protect the paths, a number of different drainage systems are put into place to encourage the water to drain off the path as quickly as possible. Due to the nature of the site there are a number of cross drains; so the small group of volunteers managed to clear in the region of thirty drains! Whilst clearing them it was identified that a number of them are needing realignment or minor repairs done to them. It is slow work but when the drains work, it not only saves the path from further erosion but also is very satisfying. So watch this space for a cross drain TLC day!